A Pass Code is required to use this category. Please note that there will be no walk-ins for volunteer job positions at the event. 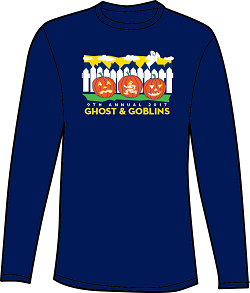 The 9th Annual Ghosts & Goblins 5K/2K, presented by the CEF, is a fundraising event to benefit the Carmel Clay schools through education grants. Founded in 1966, CEF invests in the academic excellence of the Carmel Clay Schools through grants to teachers for classroom enrichment and curriculum development. On-site registration and pre-registered packet pick-up will be available at the Carmel High School on Friday, October 27 from 4:00 to 8:00 P.M. and on Saturday, October 22 from 7:00 to 8:00 A.M. Participants are encouraged to come in safe costumes, but masks are not allowed. Prizes will be award for best adult, youth, and ensemble costumes. The elementary school with the most participants will be awarded the Ghosts and Goblins Trophy, which the school will have to display for one year. 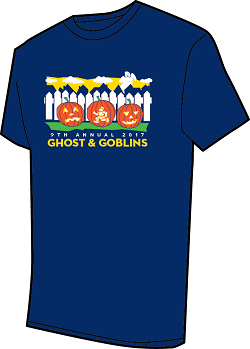 The middle school with the most participants will be awarded the Ghosts and Goblins Banner, which the school may display permanently. The event will be timed and scored. Complete timed results will be posted after the event on site and at www.CarmelGhostRun.com for chipped participants only. All Carmel High School seniors who enter either the 5K or 2K or who volunteer at the event will be eligible to apply for the Lisa Evans Scholarship. No pets are allowed in either the 2K or 5K except for service animals. To assist the registered runners in receiving their packets and t-shirts. To guide unregistered runners through the race registration process. Shift times: 3:15-6:00 P.M.; 5:30-8:00 P.M. Shift times: Friday 3:30-6:00 P.M.; 5:30-8 P.M.; Saturday 6:30-11:00 A.M.
To check in the volunteers by recording name and shift times. Shift times: Friday 3:15-6:00 P.M.; 5:30-8:00 P.M.; Saturday 6:00-11:00 A.M.
To direct participants along the designated Ghosts and Goblins 5K/2K route. When this page loaded, the official time was 9:03:39 AM EDT.